For the last 5 years we have provided a remote DICE desktop service which is based on the NX technology. Although this system has some nice benefits, particularly being light on bandwidth requirements, the technology is beginning to show its age and there is a serious shortage of good client	software for many platforms. With this in mind we have made the decision to switch to providing an RDP based service. This	has very good client support for all platforms (Windows, MacOSX and Linux). Currently we are at the stage of being able to offer staff users early access to a	test version of the service at staff.xrdp.inf.ed.ac.uk. We’re hoping that people will try it out and report back	any problems they experience. Full information on how to use the service is available on our Computing Help site. Once we’re confident there are no major issues we intend to replace the two NX services with equivalents based on RDP. The aim being to get the new service entirely rolled out before the start of Semester 1 in September. 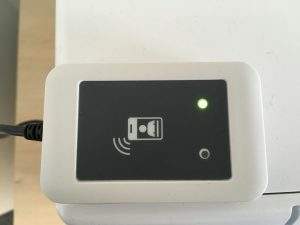 Now that every floor in the Forum has at least one cloud printing device with more to follow, I thought it might be useful to provide a few hints and tips on how to get started with cloud printing. You don’t need to do anything, the cloud queues are already installed on the School print servers. We strongly recommend that you install the IS cloud printing package. This can be downloaded here. For managed desktop machines, see here. For other Windows machines, see here. It is extremely important that you are using the correct drivers when you send a job to a cloud queue. If you have followed the relevant instructions above, this should already be the case. Since the cloud printers use the same drivers as the existing Xerox printers in the School, any options you currently use for the Xerox printers should just work with cloud queues. There are two cloud print queues, cloud-mono and cloud-colour. As the names imply, the cloud-mono queue is for jobs which you wish to print in black and white and the cloud-colour queue is for colour jobs. Note that mono documents sent to the colour queue will be charged at the rate for a colour printout. Jobs are sent to the cloud queues in exactly the same way as to any other print queue, whether via a shell command such as lpr or an application’s print dialogue box. This may not be a simple matter of walking to the nearest cloud device. Not all cloud devices are created equal and some devices are more capable than others. All cloud devices can produce A4 mono printouts. The devices on levels 4 and 9 of Appleton Tower can produce A4 colour prints and the larger colour devices on level 6 of Appleton Tower, the ground floor coffee area of the Wilkie Building and in the NE corners of the Forum can produce A3 and A4 colour and mono printouts. These latter devices are also capable of feats such as collating and stapling printouts. It’s important to remember that if you attempts to print out a job on a device which lacks a desired ability, for instance printing an A3 job on a device which only supports A4, then the job may well disappear from your queue but not actually be printed out! All cloud devices should have a poster nearby detailing their capabilities. Remember, on a device which can only do mono printouts, you will only see jobs sent to the cloud-mono queue. You can select as few or as many jobs as you like. Pressing the Print button will print your jobs out. You can also delete jobs if you’ve changed your mind. Note that jobs are deleted automatically if they are not printed out within 24 hours. 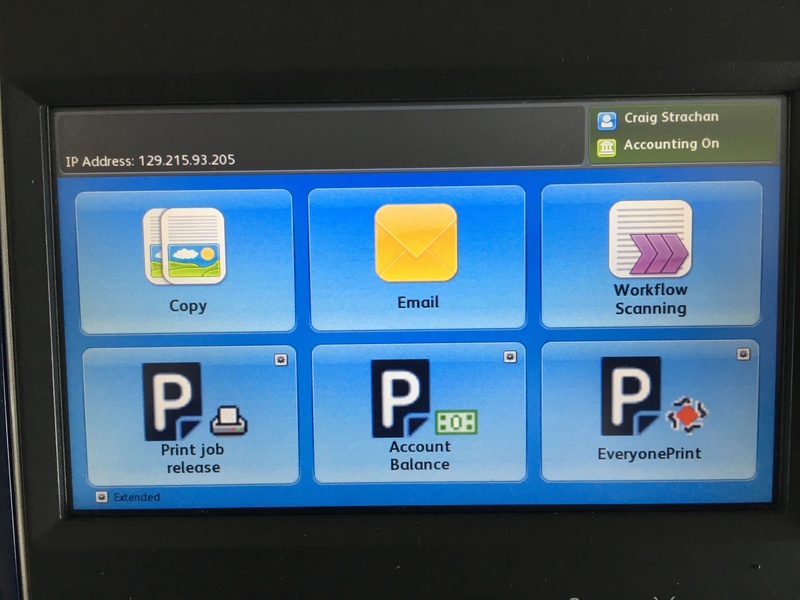 You don’t have to stay logged in while the jobs are printing, if you have a lot of printing to do, you can simply set things in motion, log out by pressing the (real) button marked with a key, and come back to pick up your printouts later. Once a printer has been cloud enabled, you will need to tap in with your card before you can photocopy or scan. A benefit of this is that when scanning, your email address will automatically be set as the destination for the scan. I tried to release a job and it just disappeared! As mentioned above, one flaw in the cloud printing system is that jobs which the printer is incapable of printing may simply disappear. 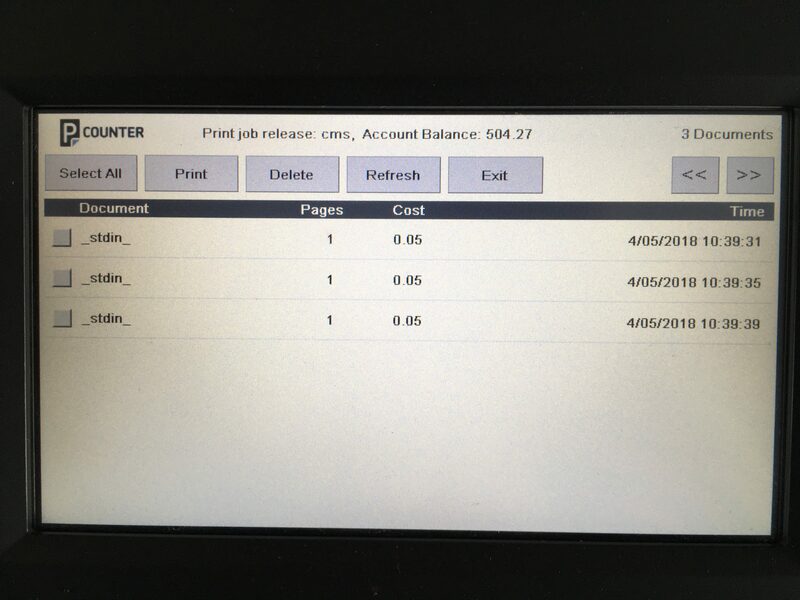 Once way to check if this is happening is to look at how much you are being charged for the job (this information is displayed in the Print Job Release screen). If you aren’t being charged a multiple of 5p for a single sided mono job or 8p for a two sided job, then you are attempting to print something other that A4 mono. We’ve noticed that applications such as Acroread can set the paper size to A3 for no apparent reason. If you have the misfortune to have to pay for your printing and this happens to you, contact support for a refund. I can’t see a Scan button! How do I scan? We’re not sure why this is happening but missing out the \printers part should do the trick. (This is just a copy of the mail I sent to staff and students earlier in the week but with an additional item about the need to turn off self managed and admin office machines). As previously advised, work being carried out in connection with the new student centre means that there will be no mains power in the Forum on Saturday 14th April. This will result in the majority of Informatics IT services being unavailable. Affected IT services will be shut down late on the afternoon of Friday 13th April. If the current UCU Action Short Of a Strike is still in place, services will be restored on the morning of Monday 16th April. If the dispute has been resolved most services should be restored on the Sunday. All group AFS and NFS file space. A large number of research and teaching servers. See https://wiki.inf.ed.ac.uk/DICE/RATUnitIFPowerdown0413 for details. Mail, both incoming and outgoing. DICE managed office machines will be shut down automatically shortly after midnight but all other self-managed office machines should be shut down by their users in advance of the power going off. Managed Windows desktops in admin offices should also be shut down before going home on Friday. If you have any questions about any of this, please contact computing support using the support form linked from the front page of Computing.help.inf.ed.ac.uk. In order to minimize the risk to computing facilities during the strike action there will be a ‘change freeze’ for those computing systems managed by the School’s computing staff. This will be effective from Friday 23rd February to Wednesday 21st March (or the end of the industrial action). Obviously there may be some business critical changes required – these will be referred to CEG (Computing Executive Group) for approval. Should all CEG members be on strike (or otherwise unavailable), Martin Wright will be consulted to determine the business criticality of any proposed change. He may chose to confer with others. I hope that you understand and support my reasoning behind introducing this freeze. Cloud Printing in Informatics – an Update. Last year I wrote an article extolling the virtues of cloud based printing and announcing the intention to extend the use of cloud printing to those parts of Informatics where it was not already available. With one or two exceptions, this proposal was greeted with some enthusiasm and so over the next few weeks, the Xerox Multi Function Devices in the North East corners of the Forum and the Wilkie Building kitchen area will become cloud enabled. One part of the proposal that caused some dismay was the prospect of only having one printer on each floor of the Forum and so it’s been decided to locate A4 mono cloud devices in the South West corners of each Forum floor and in the ground floor reception area. These devices can also act as mono photocopiers and colour scanners. For the moment the existing print queue names will continue to work but the intention is to disable these queues on the 1st of March and only have cloud queues within Informatics. The one exception to this is for printers in admin offices. Though the introduction of cloud printing removes the need for these devices, the intention is for them to remain, at least until they irretrievably break down! These printers will continue to use their existing queue names since they can’t be cloud enabled. 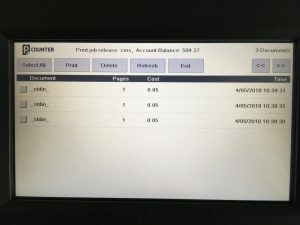 Since the cloud print queues need to associate print jobs with your University UUN, the printing setup on non-DICE machines may need some adjustment. Full instructions on how to do this will be provided on computing.help before the switch over. Arrangements to provide Informatics staff and research students with a suitable amount of free print quota will also be in place by then. UPDATE: We’ve agreed to delay turning off the existing print queues until after the end of the current semester. This will afford you all an opportunity to compare both printing methods side by side, though you may of course find yourself waiting for your cloud print job while a job sent straight to the printer prints out! We will soon be replacing all existing 100 Mb/s network switches in all of the Informatics Forum IT closets with new 1Gb/s switches. There are 17 IT closets in the Forum, each of which provides networking connectivity to its nearby offices. Typically, each closet contains three or four 100 Mb/s switches – so there is a lot of work to be done, and the entire programme will take some time. We will be doing this upgrade one closet at a time, and we will make announcements via email to let you know when any particular closet is being worked on. The switch replacement means that network connectivity will be temporarily lost for machines which are served by 100 Mb/s switches in the closet being upgraded. Typically, this means that network connectivity will be temporarily lost for machines attached to either the blue or red network cables which appear on desks in the Forum. Network connectivity should never be lost for machines attached to the grey cables on desks: those are already connected to 1Gb/s switches. The end result of this work will be that all wired network connections in the Forum will run at 1Gb/s – the only remaining 100 Mb/s connections will be those used for the VoIP telephones. The new switches also give other advantages: amongst other things, they allow us to implement better network security, and they allow us to implement IPv6 on all Forum subnets. We apologise in advance for any disruption this work will cause, and thank you for your patience. The Forum server rooms are covered by a pair of Uninterruptible Power Supplies (UPSes), one of which has developed a fault in its interface to the outside world. As a result we can neither query its status, nor expect it to signal machines to shut down when the power goes off. UPS Repair Man came on schedule on Saturday 3rd. He turned the faulty unit off, took it apart, and put some new cards in it. Unfortunately he then struggled for the rest of the day trying to get one of those new cards to recognise the specific model of UPS we have. As a result, he couldn’t start the unit up with those new cards, so he eventually stripped them all back out again, replaced the old ones, and brought the faulty unit back up in the same (faulty) state as before. He’s off to consult his base now. On the minus side, we’ll have to go through some of this again once they get an idea of what to do next. On the plus side, turning the faulty unit off didn’t appear to cause any problem for the working one (other than to have it flash a fault light, which is apparently a firmware bug! ), so we may be able to do the process on a normal day next time assuming we can find enough load to shed. There’s a new version of Virtual DICE, our lightweight DICE-like virtual machine. Here’s how to install it on your own computer. We release a new version of Virtual DICE twice a year. This version has the hostname sensa. It runs Scientific Linux 7.4, as DICE machines do. This version works better with Windows 10. To move from an earlier version of Virtual DICE, please export whatever files you want to keep (for example, copy them to your AFS home directory) then delete it and install the new sensa version instead.